The Jeanneau Merry Fisher 645 is an amazing concept. Here is a boat just a touch over 6.5 meters long yet it can sleep 4 people in two double berths, has a saloon with facing seating and panoramic views PLUS a large and very versatile cockpit that can be used for fishing, lounging, eating or sunbathing. She is available in white or in an attractive blue hull in the Legend version and constructed using Jeanneaus Prisma Process. This patented process makes for a very stiff hull which combined with a deep V hull gives a boat that is sure footed at sea and makes her a very capable coastal performer instilling confidence in all aboard. She benefits from an opening sun roof, internal window curtains & recently fitted cockpit enclosure. This example is good value and ready to be sailed away. 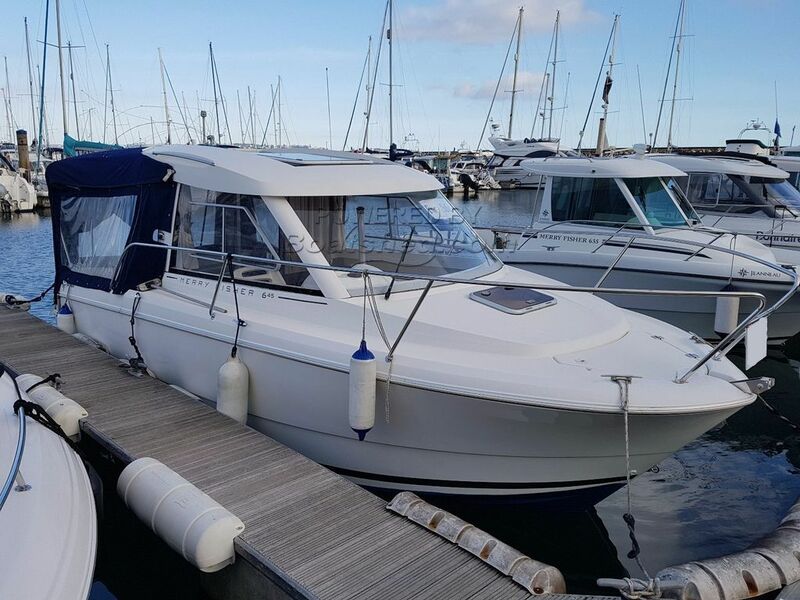 This Jeanneau Merry Fisher 645 has been personally photographed and viewed by Phil Key of Boatshed Torquay. Click here for contact details.